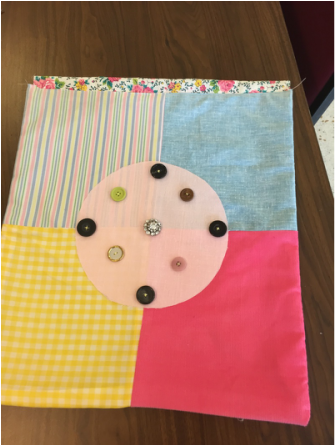 Campers made lap quilts of their design this year for themselves and then made an additional lap quilt that was donated by the campers to the Children's Advocacy Center in Lincolnton (See last two slides). The children also made a larger quilt that they will donate to Lutheran World Relief in November. This year we held our first annual Emmanuel Lutheran Church Quilting Camp 2015. We had 8 children join us to learn basic sewing techniques, including creating and finishing their own banners as well and designing and finishing a full size quilt that will be donated to Lutheran Work Relief this November. The children ranged in age from rising first grade to rising seventh grade and all demonstrated their personal creativity and willingness to learn. Thanks to Katherine, Jean, Susan, Betsy, Phyllis, Cindy, Paula and Carole for making this a successful and fun camp for all.